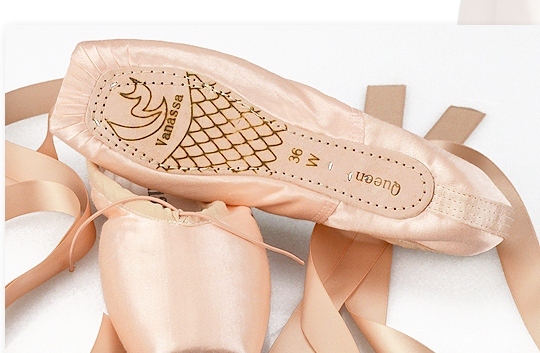 I love finding new and interesting pointe shoe brands! All the better if they happen to have a pleasing aesthetic and are made in pale peachy/pink satin. Even though I now have a backlog of brands that I need to post about, the Vanassa brand has topped the list for today. After spending some time doing what I love to do best (research), I can tell you that these pointe shoes are a Chinese brand made by the Wa Nasha manufacturing company in Hong Kong. Although I found several instances of the spelling as Wana Sha on global market websites, most spelled it Wa Nasha. The Wa Nasha company makes dance products and shoes that are sold under the brand name Vanassa. 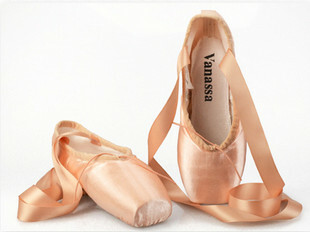 The company has been a supplier of top-quality dance shoes since 1937. There is no doubt that this brand name has a huge following of dancers. Go to Google images and enter Vanassa舞蹈鞋. You will find numerous photos of their best-selling jazz and performance sneakers for dancers. You can also see them listed for sale on Aliexpress.com., another global shopping network. I saw this brand on several Italian market sites as well. Do you see the word Queen imprinted on the sole? There is no clue whether this is the model name of shoe, or if all the models have the same stamp. My best educated guess is that the shoe is called the Vanassa Queen by Wa Nasha. As far as I know, neither Wa Nasha manufacturing or Vanassa have a direct website link to their products. The closest thing to an actual website for ordering these shoes is the Chinese version of eBay, Taobao.com. Again, trying to translate Chinese wording and symbols into legible English needs a skilled interpreter. The website where these pretty shoes can be ordered appear to have a wealth of information next to the shoe image. Sadly, the words may or may not give great detail about fitting specifications. Since my Chinese reading skills are sorely lacking, it will take more time to find out about these models. Google Translate did not help me on this one. The Vanassa Queen is available online through a private seller on the Chinese version of eBay. You can see them here at Taobao.com. Of course, finding the official website for Vanassa dance products is preferable to adding an eBay listing to the sidebar, but for now, that will have to do. Update 4/ 2/ 2018 -Links have been removed as they are no longer functional. This entry was posted in Chinese Brands and tagged Chinese pointe shoe brands, pointe shoes made in China, Vanassa dance shoes, Vanassa pointe shoes, Wa Nasha dance shoes, Wa Nasha Vanassa. Bookmark the permalink. Thanks! Is there anybody who can tell me where to buy dancewear in Shanghai? I’m going there next month and I really need to find good supliers. Thanks! I’ve seen the Vanassa Queen on eBay and was curious about them, especially as they are an affordable option! It’s been some years since you posted this [so I hope you get it! ], but I still haven’t found any specs or much info anywhere. Your blog always shows up in searches, though. Did you acquire a pair? Do you know any specs? I am most interested to know if the box is tapered. It looks kind of tapered from the photos. I am always on the hunt for a nice tapered shoe since Capezio discontinued Nicolini and Pavvlova. As far as shank/hardness I preferred shoes a bit softer, like the Nicolini. If the Queen is tapered, would you happen to know how the shank compares to these shoes as well? This is the brand of shoes I was given at the Cuban Ballet School! They are tapered, but not severely. What stood it to me is that they have an incredibly square box, in that the edges are very defined. We did not get to choose the hardness of our shoes, so I don’t know if other options were available, but the ones we were given were quite stiff. There is a seller or company named Wendy Wu that sells Vanassa pointe shoes on Amazon. There are multiple customer photos and reviews about the shoe.